We wish to continue studying the letters to the seven churches, not simply to satisfy our curiosity, but rather to learn to better love and serve You. Today, we will focus our attention on the second letter, addressed to the church of Smyrna. We humbly ask You to guide us, so that our understanding may be in harmony with the message You want to give us. In Jesus Christ our Savior we pray. «What you see, write in a book, and send it to the seven churches which are in Asia; to Ephesus, and to Smyrna (...).» Now, let’s study the second letter, addressed to the church of Smyrna. The name «Smyrna» comes from the Greek word «myrrha», which means «which gives off a good smell when crushed». Besides, this same Greek word also designates myrrh, an aromatic gum coming from the balsam tree, used as incense and for embalming human remains. «These things said the First and the Last, which was dead, and is alive.» Once again, the letter begins with a portrait of Jesus, taken from the initial vision of John. Let’s carefully look at this portrait. I am the First and the Last. I am He that lives, and was dead; and, behold, I am alive for ever more, Amen. And I have the keys of hell and of death. I am the First and the Last. I am He that lives, and was dead; and, behold, I am alive for ever more. Jesus’ title, «the First and the Last», corresponds with the «Alpha and Omega» of God, which are the first and the last letters of the Greek alphabet. So Jesus reaffirms here that He is God, just as the Father is. I am the First and the Last. I am He that lives, and was dead; and, behold, I am alive for ever more. Furthermore, the Bible confirms that the expression «the First and the Last» applies to God and to God only. Yes, indeed, Jesus is God. «These things said the First and the Last, which was dead, and is alive.» The portrait of Jesus also carries a message of hope, especially well adapted to the local church of Smyrna. Indeed, during the years following the writing of the letter, that is, during the second century, Smyrna was the scene of violent persecutions against the Christians. One of its most famous martyrs was Polycarp, the head minister of the church of Smyrna for more than 40 years, who was condemned to the stake in A.D. 155. I know your works, and tribulation, and poverty (but you are rich). Besides, the continuation of the letter brings out the hard times of this persecuted church. Here is an interesting point: history tells us that after the Apostolic Church (from A.D. 31 to 100), symbolized by the church of Ephesus, the Christian Church actually went through intense persecution for about 200 years, more precisely from 100 to 313. With the Edict of Milan, in 313, Roman emperor Constantine made Christianity the official religion of the Empire. I know your works, and tribulation, and poverty (but you are rich). Between 100 and 313, the persecuted Church indeed seemed very poor. But Jesus sees beyond appearances: though poor in worldly goods, the Church is nevertheless rich in faith, the fruit of its many trials. Listen, my beloved brothers: Has not God chosen the poor of this world rich in faith, and heirs of the kingdom which He has promised to them that love Him? I know your works, and tribulation, and poverty (but you are rich), and I know the blasphemy of them which say they are Jews, and are not, but are the synagogue of Satan. 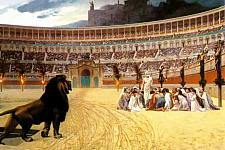 While being persecuted by the Roman Empire, the Church also had to suffer the attacks of the Jews. Historians of this time report that at the martyrdom of Polycarp, minister of the local church of Smyrna, the Jews of this city personally, and with great eagerness, gathered firewood to supply the stake, even though it was the Sabbath day. I know the blasphemy of them which say they are Jews, and are not, but are the synagogue of Satan. Jesus calls people from all nations to become Jews inwardly, not in the flesh, thus making up «the Israel of God» (Galatians 6:16), His Church. For he is not a Jew, which is one outwardly; neither is that circumcision, which is outward in the flesh. But he is a Jew, which is one inwardly; and circumcision is that of the heart. I know the blasphemy of them which say they are Jews, and are not, but are the synagogue of Satan. Jesus also brings up the danger, for the false Jew, of becoming «the synagogue of Satan» rather than «the temple of the Holy Ghost». For you are bought with a price: therefore glorify God in your body, and in your spirit, which are God’s. Fear none of those things which you shall suffer. Behold, the devil shall cast some of you into prison, that you may be tried. The letter to Smyrna goes on, still on the theme of the persecution of the Church. Behold, the devil shall cast some of you into prison, that you may be tried; and you shall have tribulation ten days. The letter to the church of Smyrna completes the dark picture by announcing that it «shall have tribulation ten days». After the number of the days in which you searched the land, even forty days, each day for a year, shall you bear your iniquities, even forty years. In Bible prophecy, a day represents a year, as we have seen in the lesson «The Four Mythical Beasts». This principle is acknowledged and used by many Bible commentators. You shall bear the iniquity of the house of Judah forty days. Behold, the devil shall cast some of you into prison, that you may be tried; and you shall have tribulation ten days. So the letter to the church of Smyrna ends its prophecy by announcing a persecution of ten years (one year for each day). Indeed, history reports that the most severe persecution during this period was the one launched by the emperor Diocletian. This persecution began in 303, and ended exactly ten years later, in 313, with the promulgation of the Edict of Milan by the emperor Constantine, which made Christianity the official religion of the Empire. Be you faithful to death, and I will give you a crown of life. Just as myrrh spreads its fragance when crushed, the martyrs’ blood, once spilled, becomes a seed of life for all those who witness their faithfulness. To all those martyrs, Jesus promises the crown of life. He that has an ear, let him hear what the Spirit said to the churches. «He that overcomes shall not be hurt of the second death.» The letter to Smyrna ends with a very appropriate promise from Jesus: the believer who goes through the first death on this earth won’t have to suffer the second death in the lake of fire, at the Day of Judgment. Blessed and holy is he that has part in the first resurrection. On such the second death has no power, but they shall be priests of God and of Christ, and shall reign with Him a thousand years. Later in the book of Revelation John saw, in vision, the fulfillment of the promise made to the church of Smyrna. Indeed, «the second death has no power» over God’s risen people. Rather, they inherit eternal life and reign with Him. We will come back to this subject in a future lesson about the Millennium. And [the second beast] had power to (...) cause that as many as would not worship the image of the beast should be killed. And he causes all, both small and great, rich and poor, free and bond, to receive a mark in their right hand, or in their foreheads: and that no man might buy or sell, save he that had the mark. Now, what is the personal application of the letter to Smyrna? Prophecy announces that faithful believers will go through very difficult times just before Jesus’ return. The advice, encouragements and promises to Smyrna, the Persecuted Church, will surely be of great help to us. «These things I have spoken to you, that in Me you might have peace. In the world you shall have tribulation: but be of good cheer; I have overcome the world.» May we all remember, at the right time, these precious words from Jesus, so that, with the peace of our Lord and Savior in our hearts, we may have the courage and strength we need to go through the future tribulation. Let’s end this lesson with a summary of the letter to Smyrna. Your Son said, «He that finds his life shall lose it: and he that loses his life for My sake shall find it.» (Matthew 10:39) This message summarizes very well the letter to the church of Smyrna. We sincerely ask You to give us this courage You gave to Your martyrs, so that we too may remain faithful until the end. The test of Lesson 23 is waiting for you! Screen 1: Picture collection «ClickArt 65,000» by Broderbund, CD #4, NATTR088.JPG. Screen 2: Photo in: «Master Clips 500,000» by IMSI, CD #24, 710101.JPG. Picture edited by Cyberspace Ministry. Screen 3: HARLAN, Russell. In: «Uncle Arthur’s Bedtime Stories, volume 5» (MAXWELL, Arthur S.), p.92,93. Used by permission. Copyright ©1964, 1965, 1967, 1968, 1976 by Review and Herald® Publishing Association, USA. All Rights Reserved. Screen 4: FRA BARTOLOMEO. «God the Father» (1509), Museo e Pinacoteca Nazionale di Palazzo Mansi, Lucques. In: «La Peinture de la Renaissance Italienne» (BECK, James H.), Editions Könemann, 1999, p.348. Screen 5: GRÜNEWALD, Matthias. «The Resurrection of Christ» (1510-1515). Unterlinden Museum, Colmar. In: «The Bible in Art» (WRIGHT, Susan), Todtri Productions Limited, New York, 1996, p.107. Screen 6: CONVERSE, James. In: «God Cares, volume 2» (MAXWELL, C.Mervyn), Pacific Press Publishing Association, 1985, p.101. Screen 7: In: «The Watchtower» magazine (February 1, 1986), New York, Watch Tower Bible and Tract Society, p.10. Screen 8: GEROME. «Last Prayers». Golvin and Landes (1990). Picture from the Web site: http://www.ancientsites.com/er/martyrdom.html Screen 9: In: «The Watchtower» magazine (December 1, 1998), New York, Watch Tower Bible and Tract Society, p.3. Screen 10: In: «The Watchtower» magazine (November 15, 1988), New York, Watch Tower Bible and Tract Society, p.8. Screen 11: JUSTINEN, Lars. In: «Questionnaire Adulte de l’Ecole du Sabbat», Pacific Press Publishing Association, Fourth Quarter, 1996, front cover. Screen 12: In: «The Watchtower» magazine (September 15, 1994), Watch Tower Bible and Tract Society, p.16. Screen 13: Photos by DUIGAN, Michael. Roman Emperors «Trajan», «Hadrian», «Antonine», «Marcus Aurelius», «Septime Severius», «Valerian». In: «Chronique des Empereurs Romains» (SCARRE, Chris), Casterman, 1995, pp.84,85,159. Composite picture by Cyberspace Ministry. Screen 14: In: «The Watchtower» magazine (November 1, 1991), New York, Watch Tower Bible and Tract Society, p.8. Screen 15: Photo by BAKER, John. In: «Signs of the Times» magazine (July 1990), Pacific Press Publishing Association, p.23. Screen 16: «Diocletian - Coin, Roman bronze». In: «Collier’s Encyclopedia Deluxe 1998», Sierra Home. Picture edited by Cyberspace Ministry. Screen 17: In: «The Watchtower» magazine (December 1, 1988), New York, Watch Tower Bible and Tract Society, p.15. Screen 18: BAZZI, Giovanni Antonio (1477-1549). «St. Sebastian», Palazzo Pitti, Florence. In: «The Art of Angels» (LOXTON, Howard), Regency House Publishing Limited, 1995, p.70. Screen 19: Picture from the Web site: http://home.hiwaay.net/~scaudle/Animation/AnimationShots.htm Screen 20: ZINGARO, Charles. In: «The Bible Story, volume 5» (MAXWELL, Arthur S.), p.152. Used by permission. Copyright ©1955, 1983 by Review and Herald® Publishing Association, USA. All Rights Reserved. Screen 21: In: «La Révélation - le grand dénouement est proche», New York, Watch Tower Bible and Tract Society, 1988, p.195. Screen 22: GREENE, Nathan. «The Invitation». In: «Inspirational Fine Art», Hart Classic Editions (www.hartclassics.com), p.2. Screen 23: REMMEY, Paul. In: «The Bible Story, volume 9» (MAXWELL, Arthur S.), p.181. Picture edited by Cyberspace Ministry. Used by permission. Copyright ©1957, 1985 by Review and Herald® Publishing Association, USA. All Rights Reserved. Table of Screen 23: CONVERSE, James. In: «God Cares, volume 1» (MAXWELL, C.Mervyn), Pacific Press Publishing Association, 1981, p.124. Screen 24: Picture collection «ClickArt 65,000» by Broderbund, CD #4, NATOT003.JPG.